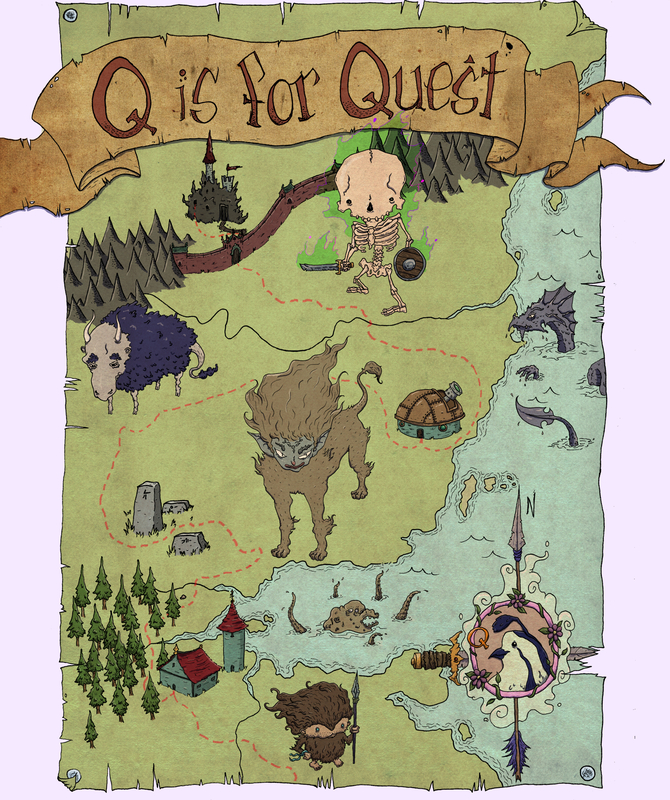 This is the map I drew for We Heart Arts’ AwesomeBet (awesome alphabet) project. Click through to their website for more information but the plan with the AwesomeBet is for a whole bunch of illustrators and designers to create pieces based around the letters of the alphabet, with the intention of turning them into limited edition A3 prints (some of which have already been printed by Awesome Merchandise, are on sale, and look fantastic) and then eventually a collated book that contains them all. I’m not sure if all the letters have been assigned already but it might be worth a look if you’re an artist yourself! This entry was posted in Uncategorized and tagged animals, Arrow, Awesome Merchandise, AwesomeBet, Ax, Axe, Beast, Beasts, Bow, Cartography, Cartoon, Comic, Creepy, cute, D&D, Desert, Dinosaur, Dragon, Drake, Dungeons & Dragons, Dungeons and Dragons, Dwarf, Dwarfish, Dwarven, Dwarves, Dwarvish, Elf, Fantasy, Hobbit, magic, magick, Map, monster, Monsters, nature, Necromancer, Necromancy, Pathfinder, Pygmie, Quest, RPG, Sheep, Skeleton, Sphinx, Undead, Vintage, We Heart Arts. Bookmark the permalink.